We went to Jared Strokon with Sun Life for this article which we thought was fantastic! Who are you really protecting? Mortgage insurance is just that – protection for the bank, not you. When you sign a mortgage, the bank has now assumed that risk. By adding mortgage insurance, you ensure that in the event of an unexpected death, the bank doesn’t get stuck with the bill. Spend your money wisely. Your mortgage broker has worked hard to find you the best mortgage, the best rate, and the best options. You should apply the same philosophy when looking for insurance. Mortgage insurance issued through your lender is typically very expensive to begin with – and rates normally increase every three to five years, making your coverage more expensive as time goes on. Beware of declining coverage. Mortgage insurance only protects the bank’s risk. As you pay down your mortgage, the bank’s risk becomes less, so you essentially have an insurance contract with declining coverage. Every time you make a mortgage payment, you reduce your coverage. When you eventually pay off your mortgage, your insurance coverage ends. The bank decides how much insurance you can have. Mortgage insurance will cover what you owe to the bank – but there are other obligations to consider too. Paying off the mortgage will make your mortgage payments go away, but property taxes, utility bills and general maintenance will be ongoing expenses for as long as you own your home. “I don’t see your name on the list…” These days, most families are dual-income families – and they rely on both incomes to make ends meet. That includes making mortgage payments, which is likely one of the biggest line items in the family budget. Mortgage insurance only covers those who are listed on the mortgage – and will not pay out in the event of the death of the other income earner, if they aren’t included on the mortgage. You can’t take it with you. Since mortgage insurance is tied to your mortgage, you leave the insurance behind if you switch lenders at renewal. Of course, you could re-apply with the new lender, but if you have been affected by a significant health event in the interim, then you may not qualify for new coverage. 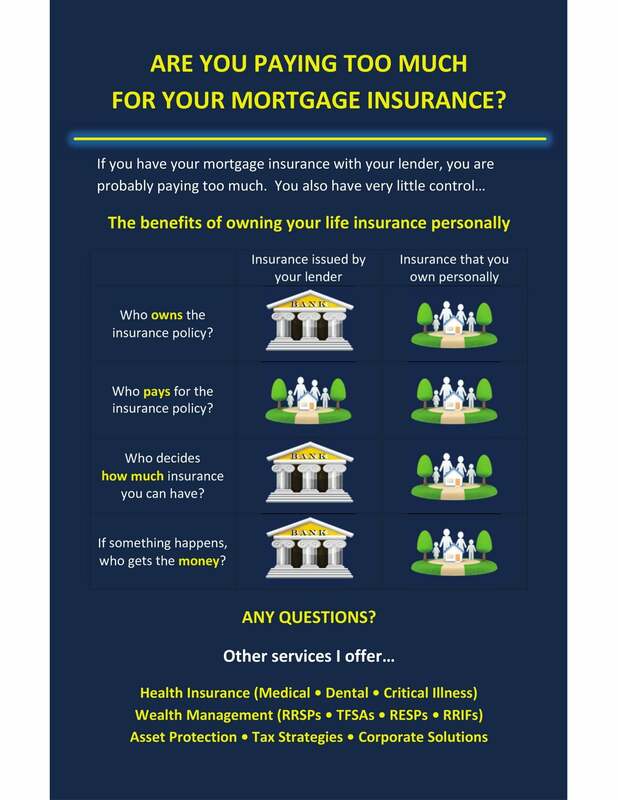 With all this in mind, consider life insurance as an alternative to mortgage insurance. You decide how much insurance you need. In the event of a claim, you decide who gets the money, and how it gets used. Your coverage remains the same, so if you decide to pay off the mortgage, you keep the change. Life insurance is underwritten up-front, making the claim process relatively simple – and you can cover your whole family (including children) regardless of whether or not they are responsible for the mortgage. And, since life insurance is not tied to your mortgage, it is completely portable, allowing you the flexibility of switching lenders at any time. Your rates can remain the same for up to 30 years – and your coverage can be converted to permanent insurance so that your coverage lasts as long as you do. Buying a home is likely one of the largest purchases you will make in your lifetime. Having the right insurance in place gives you and your family the protection you need.